In these trying times of environmental, social, economic and political change, the deliberate decision to promote peace in the world is essential for our human survival. If we are to really change our planet, we must begin by changing ourselves. We must learn to honor our planet as a living being, and interact with her with love and awareness. As Mother Teresa said, "I would rather go to promote peace than go to an anti-war rally." This is what Planet Heart's ANNUAL EARTH DAY EVENT in NYC has been doing every Earth Day since 2007. World Peace Earth Day Celebration is the brain child of Event Producer Andrew Kaen. He was diagnosed with an acoustic neuroma tumor in 2005. A professional photographer raised in NYC with a passion for spiritual healing, Andrew found solace in spirituality and healing and decided to share that with the world. Andy says, "I created these events because after my operation that removed the tumor, I knew that the human spirit was more powerful than any hospitals. I wanted to spread the healing energy universally by creating a World Peace Earth Day event." 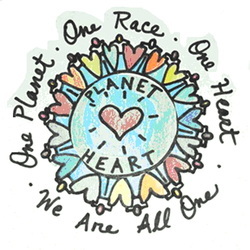 In 2007, concerned with the state of the world, Andrew started an annual event for world peace on earth day, forming PLANET HEART, a project of We, The World, a non profit 501 (c) (3) organization (www.wetheworld.org). It's mission is to help bring all humans together in harmony on a global scale and to cultivate a world of peace, helping us to realize that WE ARE ALL ONE. Rick Ulfik, Founder of WE, THE WORLD says, "Andrew Kaen has put together a phenomenal event that is not only fun but makes an impact on World Peace. His passion and tireless dedication has shown us that we can all make a difference in helping the world." If one takes the letter, “h,” from the end of the word “Earth” and moves it to the beginning, it forms the new word, “Heart.” This is Planet Earth, yet, we are also living on Planet Heart. Where our hearts beat as one - We Are One. We just have to remember. Some of us are and it is our job to spread this energy and do things that make a difference. Many of us, like We, The World, are working to make the world a better place for us and for our children. We are living in very auspicious times. People in spiritual communities and organizations, and the “New Age” Movement already know this, but we need to wake up the others who are still sleeping. The rate of awareness is increasing. So, this is the meaning behind the name, Planet Heart. By being a Project of We, The World, we aim to extend their mission and believe that Planet Heart’s mission is at the heart and core of that of We, The World. On YouTube, you can view some of the coverage from the 4th Annual World Peace Earth Day Celebration, documented by Abdul Hakim, of Activist Nation. https://www.youtube.com/playlist?list=PLA666A864750BC891. He also documented the 6th Annual World Peace Earth Day Celebration, which was a three day event which focused its theme only with Native Elders and their messages. An interview promoting the event, by our media sponsor, Good News Broadcast, can be viewed at https://www.youtube.com/watch?v=TQZUcO61-Pw . "It was such an honor to participate in this event! The energy of love and joy was palpable in the room and throughout the evening, as I sat awaiting my turn to speak, I felt this laser beam of love at my heart. It was truly a celebration of our planet, Mother Earth, and Love infused everyone and everything. I enjoyed the diversity of the presentations and learning how each individual and/or organization is assisting our shared journey to re-establish Love, Peace and Harmony. It all begins with Love of Self. Thank you, Andrew, for leading this event and may its vibration permeate all our efforts to establish Love, Peace and ecological balance on our beautiful planet." "The event was wonderful! I enjoyed every part of it. It was different from last year and it had a different quality which was equally valuable. The last piece with the didgeridoo, crystal bowls and chanting etc... was very powerful. It cleared my body and soul from the energy of the city life. "I enjoyed the event -- my favorite part was at the end, I LOVED the part with the digeridoo playing and the ladies healing. Thank you for inviting me, you brought so many wonderfult teachers and healers together and did an excellent job! " "I really want to express my graditude for the evening full of love at the Meta Center. It was real GREAT and I'm so glad I was there. The Earth Day at Meta Center was a wonderful mix of music, spiritual inspiration and community. I felt healed and gifted by the network of speakers and talent and knowing that so many people care about our wonderful home called Earth."